Julie is a determined, stubborn girl with a passion for justice. This is no exaggeration: she literally refers to her assigned weapon as her “justice ball.” Even being a police officer, she tends to follow her gut more than her orders (being influenced by her previous boss until she took over). Due to family problems that she’s not going to tell you about here, she suffers from abandonment issues and is easily offended by criticism. Don’t tell her I told you that. However, she tries her best not to let these insecurities get in the way of her duties, and will often work even harder when challenged. She is a workaholic, but her friends occasionally manage to pull her into the world of movies and concerts (and sometimes alcohol). Julie was abandoned by her mother and step-dad at age 8 and taken in by Boss, who adopted her legally after her parents won the court case. She didn't take his name because she was little and the idea freaked her out. She suffers from abandonment issues now because of her childhood, so whenever someone disapproves of her, she gets really scared. She got hybridized when she was 16 and has always wanted to be a police officer. She struggled a lot when she first joined, partially because she had a lot to learn about how to do her job right, and to be frank, she is still learning. Decided to update Julie's ref because I don't like looking at the old one haha. 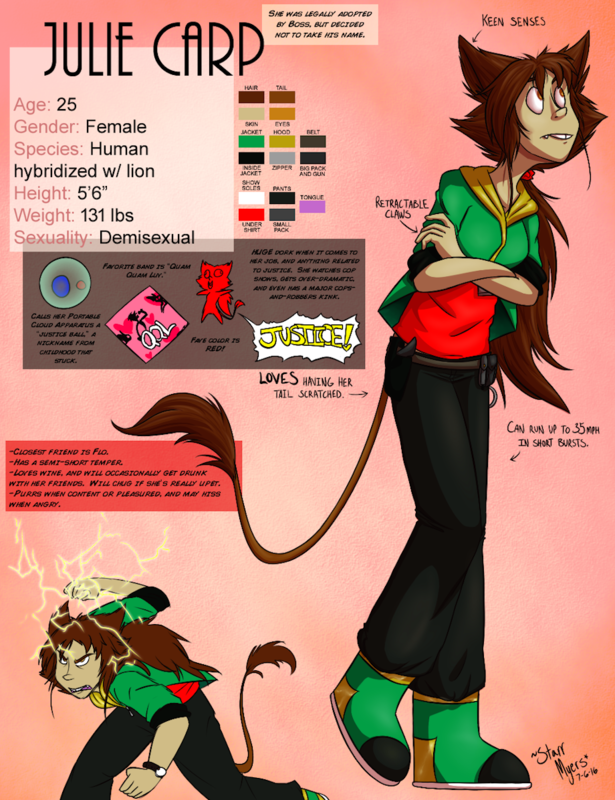 And the info below isn't all that impressive atm because for some reason, I can't find any official stuff on her since she's older than the others. Like, I've written lots of stuff about her, which later became outdated info, but by now she's so developed that I guess I didn't feel the need to put the words down, so I just kinda scribbled up what I could think of for everyone else. Also, do you think my highlights are good or should I make them brighter like in previous pictures? Abilities: Can run up to 35 mph in short bursts due to her lion DNA – not as fast as a lion, but faster than a human. Retractable claws and fangs. Keen senses.